Beck's first album of the new millennium surprised us all, once again putting the party on hold in favor of calmer tunes that were conspicuously devoid of samples, grooves, and even the slightest tinges of humor or playfulness. Exacting and deliberate (in the best sense of both words), this collection gave us unfiltered access to what was really at the heart of all this chaos, and we finally found out what we had long suspected: Beck had feelings. 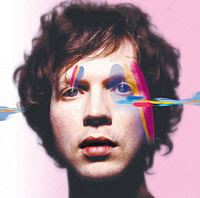 By all credible accounts, the unflinching and dour sentiments of love lost found herein can be attributed to a huge transition in Beck's personal life (hence the title), which is openly apparent by even a quick glance at the song titles. The majority of the tracks are certainly classifiable as acts of catharsis, and it's a method which Beck had successfully employed on some of his previous records (see: "Truckdrivin Neighbors Downstairs (Yellow Sweat)" from Mellow Gold) but never in such a deeply personal way. While it may have strayed too far off the beaten path for some (what is with these fickle fans? ), for most folks, it worked perfectly. And when I say "most folks," I mean "every girl I know who has ever taken the time to really get to know this great record." There are a lot of important bands that have written and recorded, while in the midst of personal strife and turmoil, some really great breakup records. I'll be coming across a handful of 'em in the course of digging through my music, and I think this is the first one really worth adding to the list. The breakup record is one of my favorite things in music. They're usually uneven, sometimes regretfully open, often mean. I'll find time to annoyingly postulate on this later, because I could go on for far too long. Just know that if you're ever at the end of a long and trying relationship, this is one of those records that's there for you. I don't want to get on the Nigel Godrich train of humpery, as it's way too full already, but as a producer, the man knows what he's doing. These songs are flushed out perfectly, more than worthy of a solid headphone listen. This is probably most easily observed in the reworking of "It's All In Your Mind," a song from the mid-90's that Beck released as a 7" post-One Foot In The Grave. The version here is given a tasteful string treatment and ends up being, while structurally and lyrically the same, a completely different experience. And it fits the theme of the album perfectly. I have to be in the right mood (depressed) for this one, but when that time comes, this is good record to have around. I was dating a girl around the time this came out, and when she made a mix that prominently featured "Lost Cause" as the opener and "Already Dead" somewhere in the middle, I knew we were through. I guess it works both ways. So, you know, watch out for that.